Once a year, during the month of February, the small city of Tucson in the U.S. state of Arizona becomes a vast bazaar of gems, fossils, geodes, and just about everything under the desert sun you can imagine. One of the beautiful Paraiba tourmaline and diamond rings created by Caroline C.
Once a year, during the month of February, the small Arizona city of Tucson turns into a bazaar of gems, fossils, geodes, jewelry, and more. In reality, however, it is not one show, but around 45 fairs of all sizes sprawled across the city. Large tents, hotel rooms, and roadside exhibits make this February gathering a must-attend for tens of thousands of visitors from the Americas, Europe, and Asia. While many shows are open to the public, others are reserved for the trade, including the two largest—AGTA GemFair™, in the Tucson Convention Center, and GJX, located in an enormous temporary tent across the street. Despite canceled flights due to snowbound areas of the USA, the two trade fairs opened under sunny skies on February 3. A record numbers of buyers—retailers, jewelry designers, museum curators, and collectors—lined up to participate in the world’s biggest six-day treasure hunt for gemstone buys, bargains, and bragging rights. “It was a fantastic opening and set the tone for an outstanding week,” commented Douglas K. Hucker, CEO of AGTA. The selection at AGTA and GJX was vast, with something for every taste and budget. Some dealers, such as Germany-based Constantin Wild indicated that fine quality stones of all types sold well. He showcased a wide variety of fabulous gems in a range of sizes. At other price points, we were able to discern a few general trends. The favored gems in Tucson appeared to be green tourmaline and tsavorite. “The demand for green tourmaline is high at the right prices,” explained Marcelo Bernardes of Brazilian dealer, Manoel Bernardes, “but supplies are difficult to come by.” Bella Campbell of Kaiser Gems, agreed, “Green tourmalines are hot now because the supply is so low.” Tsavorite, on the other hand, was available and buyers came out in full force. “The first day of the show was our best ever,” smiled Bruce Bridges, of U.S.-based Bridges Tsavorite, and son of tsavorite’s discoverer, Campbell Bridges. “Most sales were in the bread-and-butter range of 0.5 to 3 carats,” with buyers mainly from the U.S.
At Philip Zahm Designs, Mark Davis stated that tsavorites in the 4 to 5-carat range attracted a lot of attention, again mostly from U.S. buyers. Shimmering green cat’s-eye tourmaline was seen at Brazil-based Tavares Gems. “Many Chinese and Japanese buyers appreciate our cat’s-eyes,” smiled Osorio Tavares Filho, who sold out of the yellow varieties on the first day. Niveet Nagpal, V.P. at Omi Gems, agreed that the hottest spinels are red, pink, and purple, in the 2 to 5-carat range. “They are somewhat undervalued, so prices are still reasonable.” Most of his buyers were from China and Japan, with a few from Australia. Tim Roark, of U.S.-based Tim Roark, Inc, was happy with his sales of rubellite, pink tourmaline, and rhodolite, as well as other pink to red garnets, “in 3 carats and larger, many purchased by Asian buyers.” Kate Farnsworth, of U.S.-based Parlé, observed that “Rubellite, sourced from Nigeria, was a good seller,” but she lamented that “higher qualities are becoming harder and harder to find.” Bella Campbell echoed this sentiment, but went on to say that morganite was available and selling well. In the orange end of the warm spectrum, fire opal was seen to be rising in popularity and price. Clement Sabbagh of Brazil-based Ben Sabbagh Bros., stated that the orange stone was becoming more popular with Chinese buyers as they learn about the gem. While green and pink may have been the bestsellers, blue stones, especially the neon shades of Paraiba tourmaline were sought by many buyers. Trays of the exotic gems, in sizes ranging from melee to 5 carats, were found at the booth of Brazil Paraiba Mine, the only major source left in Brazil for the popular gems. Director Sebastian Ferreira, also offered Brazilian Paraibas in lovely carved butterfly wings. Tanzanite specialist, U.S.-based AG Color, showcased a variety of sizes, shapes, and cuts, along with exquisite tanzanite and diamond jewelry. Hemant Sanjay, director, stated that cabochons were extremely popular with buyers from all over, although facetted stones did well. The other blues that were appreciated at the shows were turquoise, lapis, and blue topaz. Elena Drukker, designer for Drukker Designs, who exhibited in the jewelry section of AGTA stated that her blue topaz jewelry did quite well. Tucson was full of rare and exotic gems as well. Among the more unusual gems were trapiche sapphires at Thailand-based Primagems. Director Jeffery Bergman explained that the gem gets its name from the hexagonal structure that is reminiscent of the six-spoke Spanish wheel used to crush sugarcane. Having undergone a name change last year, Csarite® was available at the booth of The Courtney Collection, under the direction of designer Erica Courtney. She also showcased the world’s largest faceted Csarite®, a 121.65-carat pear-shaped gem, which attracted a lot of attention. Other “nontraditional” jewelry could be found at the booth of Gem Art Center, where designer Helen Serras-Herman featured a number of artistic pieces, including a colorful pendant made of azurite and malachite. Gems aside, a number of very talented designers were also at the shows, including a few featured here. A faceted 5.8-carat tsavorite from Bridges Tsavorite. Green tourmaline catseye from Tavares Gems. 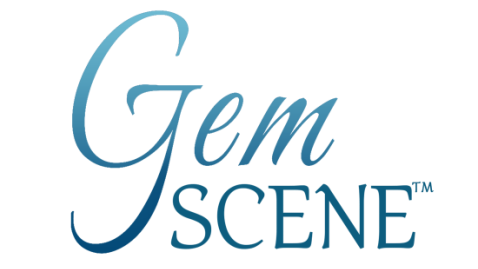 Selection of loose tanzanite gems and finished diamond and tanzanite jewelry from AG Color. Pair of 15-ct aquamarines by Constantin Wild. Pink heart sapphire from Philip Zahm. Austrailian Koroit opal and black opal from Cody Opals. 121.65-ct Csarite by The Courtney Collection (above left); Malachite and azurite pendant by Gem Art Center (photo, Gary Roskin); Paraiba tourmaline by Brazil Paraiba Mine (lower left); Blue topaz ring from Drukker Designs.